This is a project to improve the drainage and reduce flooding in this area of the neighborhood, very similar to the bigger project down Bull Creek Road. It will help with flooding caused by too much rain in too short a time overwhelming the storm drain system, not with flooding caused by Shoal Creek overtopping its banks. 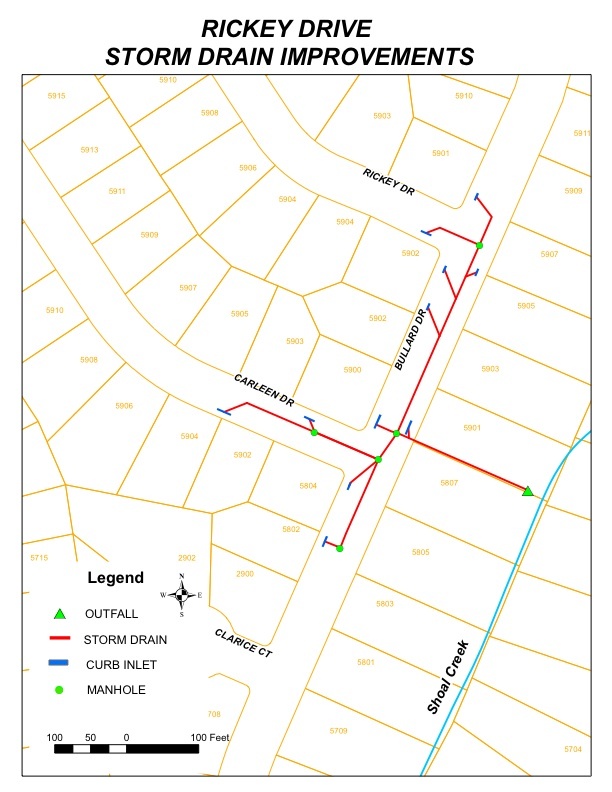 The red line on the map is a new storm drain pipe that will be placed under the street; the green circles are new manholes; and the short blue lines are new curbside inlets (they will be right on the curb – the map makes it look like they are in the street). Also, we will be installing an outlet on Shoal Creek between 5901 and 5807 Bullard and doing some streambank restoration to repair the bank and prevent erosion in the area of the outlet. Since it’s got a small scope, this project was originally planned to be entirely in-house, with our engineers doing the design and our field crews doing the work. However, the outfall will require some specialized equipment, so we decided to piggyback the construction of the outfall on the bigger storm drain project down Bull Creek Road, meaning the same the contractor will handle the Bull Creek project and the construction of this outfall. Next week we will be doing some boring in the street to prepare for the project. I think some of the immediate neighbors are aware of the project because we’ve been in contact about easements.